Usually driving for me is just getting from one place to another. Not so in the Keys. The drive down US 1 through all the Keys is the only place I ever make a lot of stops… I do some sight-seeing instead of just getting there. It was lunch time so I only intended to made it to Islamorada… about 15 miles down the road. The place I almost always stop is Kokomo… duh! Kokomo is a tiki-bar in the Holiday Isle complex. To my horror, Kokomo is no longer there. The Holiday Isle is now the “Postcard Inn” and all references to Kokomo are gone. I got back in the car and headed back down US 1 toward Key West. This was my first time to visit the Sunset Grill and Raw Bar for lunch. Other times were for an evening meal which were great. I generally linger there till they threw me out late in the evening. This time it was just for lunch so I had their Jerk seasoned grilled chicken sandwich. I ate out by the pool. Since I was driving, it was just water for me to drink. After that it was back on the road. The Sunset Grill and Raw Bar is just before the Seven Mile Bridge. The Seven Mile Bridge. 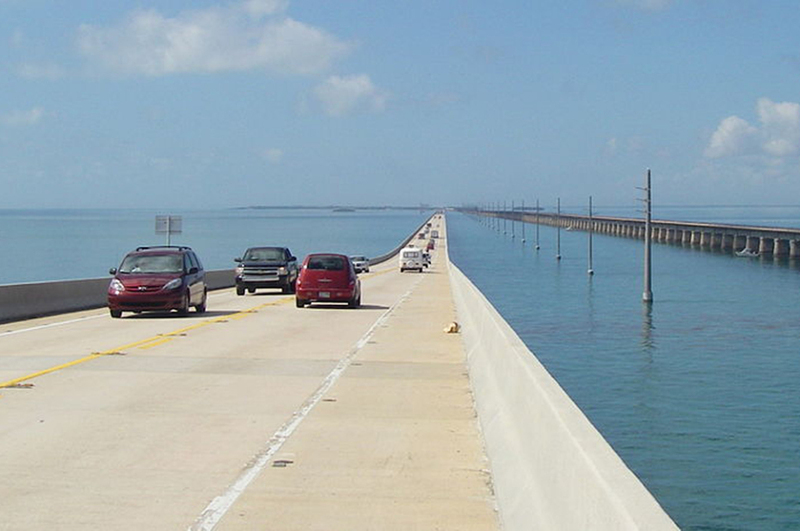 Since I always drive, I don’t have any pics of the Seven Mile Bridge of my own, so this one is courtesy of Lightenoughtravel via Wikipedia. The Seven Mile Bridge is really just short of 7 miles long… about 6.8 miles, but then who’s counting. It just goes out across the ocean. In any case, it’s one of the Florida Keys icons. Note that the bridge off to the right in the pic is the old railroad bridge that is no longer in use except for walkers and I think bicycles. You will see remnants of the old railway bridge all along the way to Key West. I love driving down the Keys. It was still quite warm for this trip and with the top down there’s just something magic about that drive. 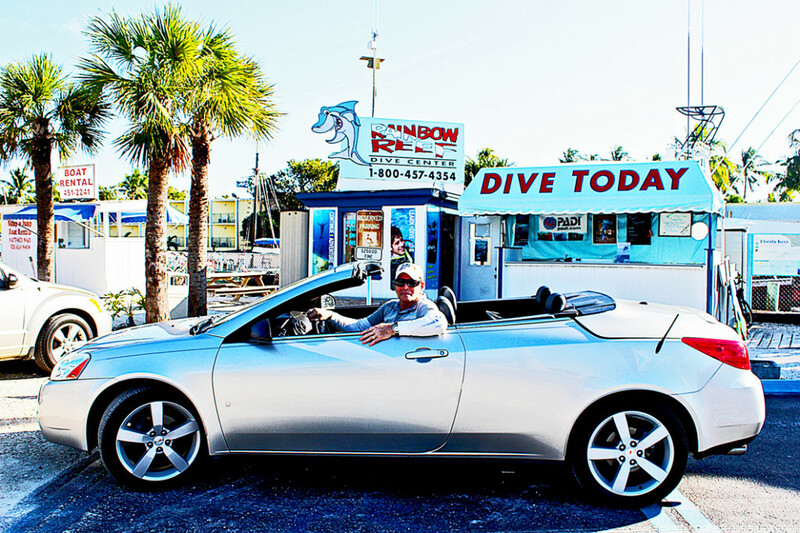 My next stop was in Big Pine Key… about another 16 miles from the Sunset Grill & Raw Bar. Big Pine Key is where a lot of the endangered Key Deer live. Key Deer only live in the lower Florida Keys. Big Pine Key is a preserve and sanctuary for the deer. As you drive onto Big Pine Key, there are warning signs and flashing lights to slow you down. I’ve never seen any of the Key Deer in the area with all the flashing lights and warning signs. However, you can always find them on near-by “No Name Key”. No Name Key is off to the west of Big Pine Key. You turn right a little bit after you enter the town and drive out. There’s a small sign that points to No Name Key, but you have to look carefully to see it. Like I do on most trips down the Keys, I drove out to No Name Key to see the deer. It’s really no big deal… The Key Deer are just like “regular” deer except that they are smaller… about the size of a large dog. I don’t know why I always want to go there, but it’s a nice drive and another of those iconic “Keys” things. If you’ve never seen a Key Deer, take a little time to drive out there. I didn’t have any pics showing the relative size of Key Deer, so this one is courtesy of No Name Pub. 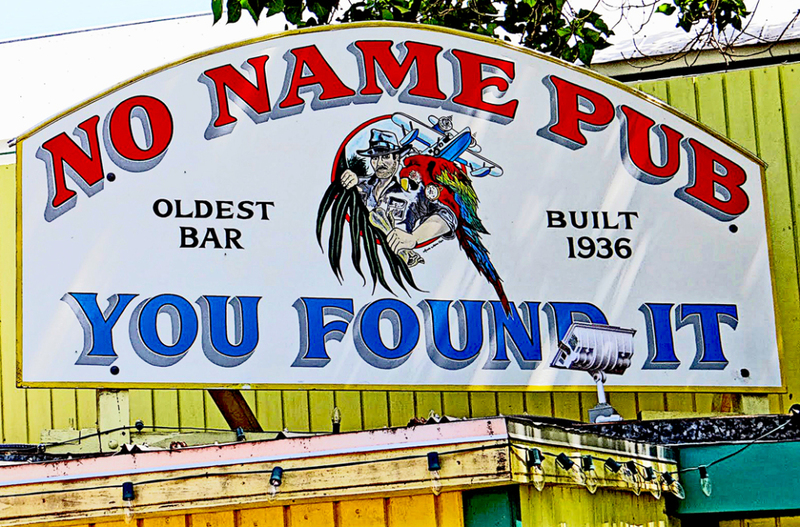 Another reason for going out there is the “No Name Pub”. Despite its name, it is not on No Name Key. Instead it is still on Big Pine Key on the way to No Name Key. This is another of those “Keys things” everyone has to go to at least once. The No Name Pub is a funky little place with dollar bills covering the walls. Although they have a full menu, most people seem to have their pizza. Seating is mostly outside on picnic tables with umbrellas. I didn’t stop this time ‘cause I had already eaten. 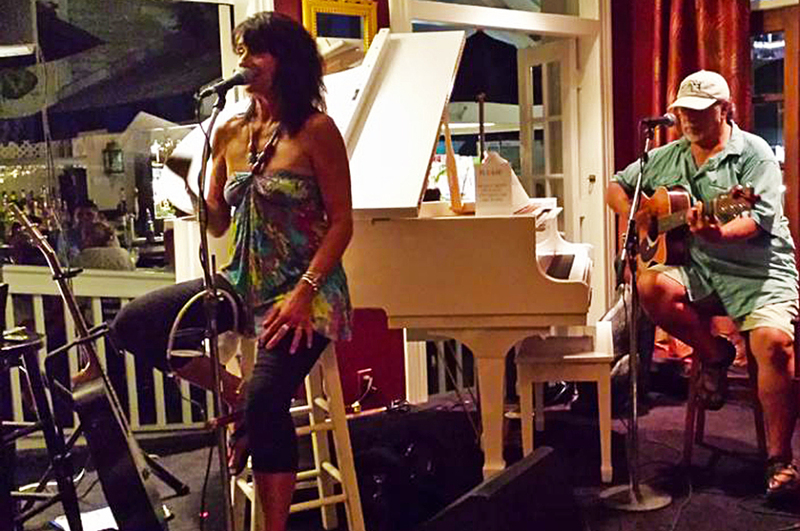 But if you are driving down the Keys and have not been there, it will be worth your while to check out this old­-time Keys hang out. Big Pine Key is about 30 miles from Key West… and it’s a nice drive. But other than another batch of Keys that are “stepping stones” for the “Overseas Highway”, I have no idea what’s on any of those Keys. With names like Cudjoe Key, Summerland Key, and Sugarloaf Key you would think I would stop and check them out. I always tell myself that I’m going to stop at watering holes with names like Mangrove Mama’s and Square Grouper Bar and Grill… or any of the dozens of tiki bars along the 30 miles. There are also several SCUBA places that should tempt me to stop. But nooooooo… by the time I leave Big Pine Key I’m foaming at the mouth to get to Key Weird. The slower traffic on the two lane road seems to get more aggravating. I know there’s a frozen concoction to help me hang on waiting in Key West. Since I’m driving, I can’t have that concoction till I get there. It’s not just the booze that’s waiting. It’s the whole Key West experience. I’m like a kid at Christmas… “I just can’t wait”. I have been remiss in getting these out. Considering that most of the country is in the deep-freeze today, I hope as you are hunkering down this will bring you back a bit of summer. 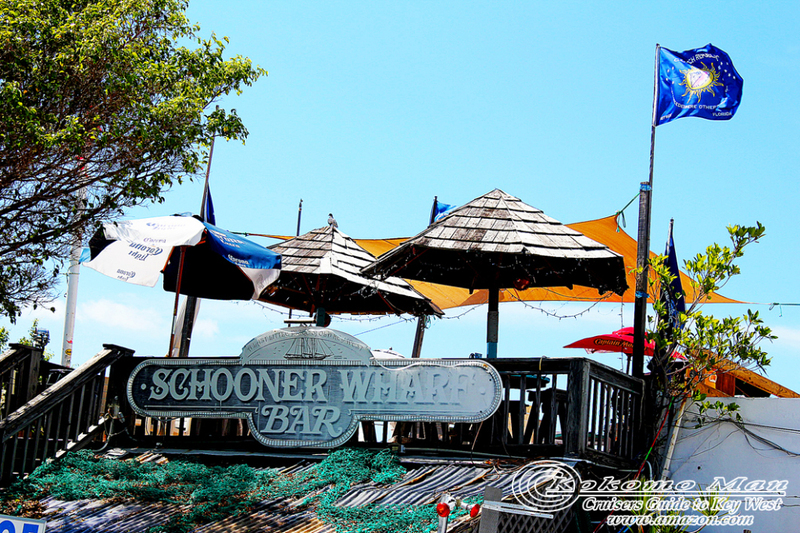 Before I talk about my second day of diving, I need to tell you about one of my favorite places to eat in Key Largo. Actually I have three favorite places… Hobo’s, the Sundowner, and Mrs. Mac’s. 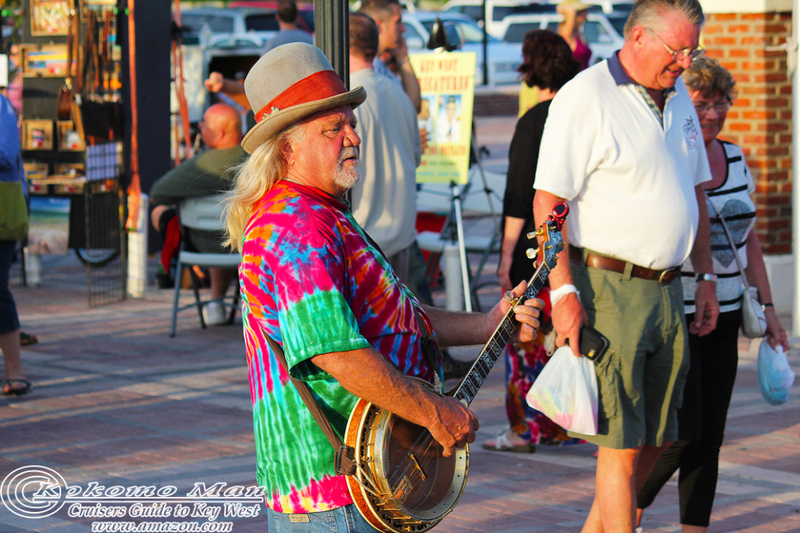 Hobo’s, like most places in the Keys, has a lot of sea food. But… I go there for the burgers. I think theirs are the best in Key Largo. 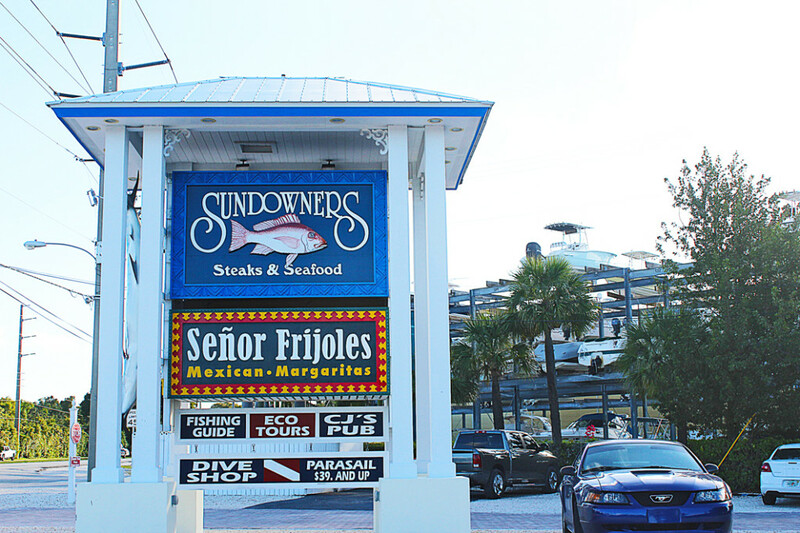 Sundowners is a place right on the FloridaBay. It’s kind of an upscale place… at least upscale for the Keys. So shorts, and flip-flops are still perfectly acceptable. The big deal at Sundowners is the sunset. If the weather is right, you can sit on their “outside porch”, have a great meal, a couple of tasty margaritas, and watch the sun set. 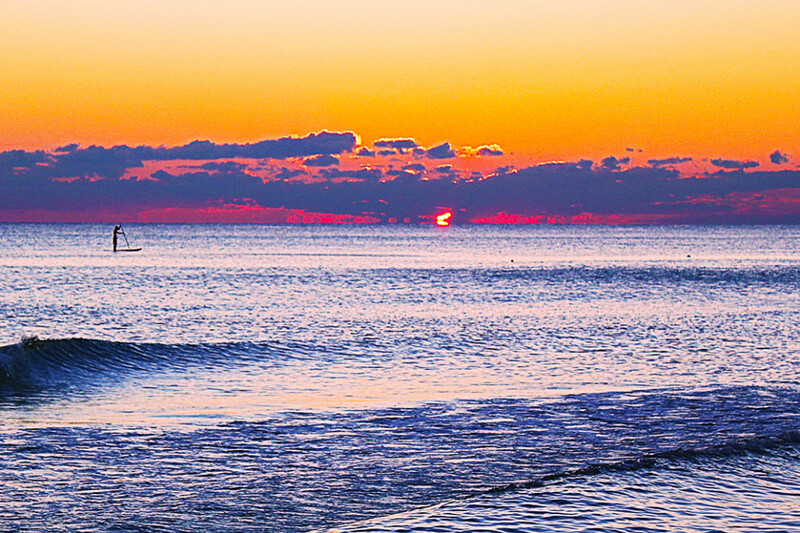 It’s an amazing sight as the big red, orange, and yellow ball sinks into the distant ocean and mangroves. It ranks among the best sunsets I have ever seen anywhere in the world. One of the best places for sunset dining in the world. 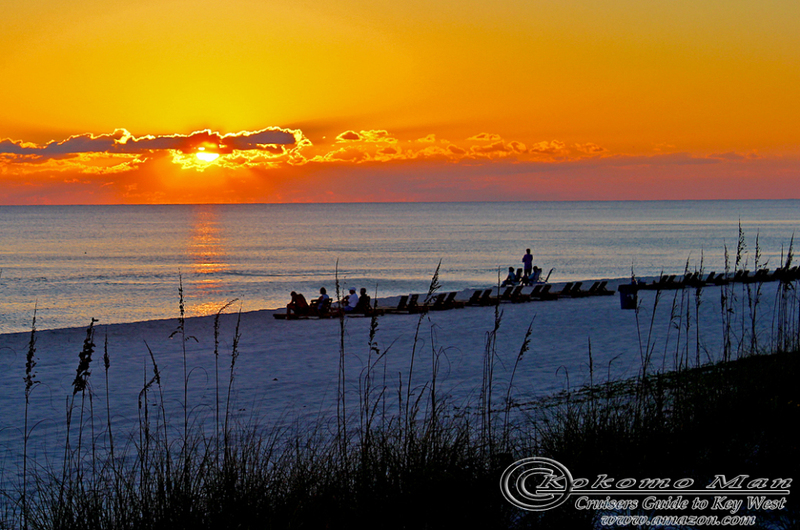 You can also go for the Mexican, fishing, or diving, but it’s the sunsets and seafood that bring me there. A table inside Mrs. Macs. Mrs. Mac’s is my favorite place. I never go to the Keys without eating dinner there at least once. Mrs. Macs now has two places… the original that’s been there forever and a new one about another 1/3 mile down the road. I always eat at the original because I just walk there from where I stay. It’s kind of a “hole in the wall” place. I call the décor “early American trailer trash — funk”. 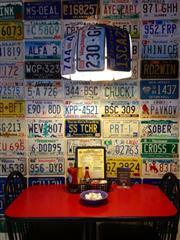 The walls are covered with license places from all over the country and the lamp shades are made from bent-up license plates.But don’t let any of that fool you. It is clean and the food may be the best in the Keys. They have been voted “The Best” in the “Peoples Awards” year after year. By the crowds that are always there during the tourist season, all the food must be good. I say it that way because I have only ever had one thing to eat every time I’ve been there… Mahi- Mahi. It is the best I’ve eaten anywhere. I also get the black-beans, cole-slaw, and top it all off with Key Lime Pie. I ate there this trip and as usual it was mmmmmm-mmmmmm good. 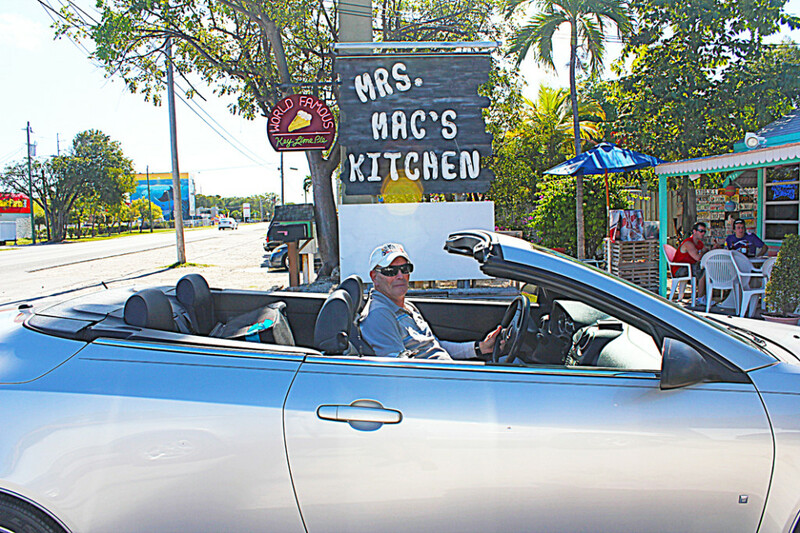 Mrs Mac’s Kitchen… Original location. The next morning’s dive was to a ship-wreck. A US Coast Guard cutter, the Duane, was sunk as an artificial reef. Diving on the Duane is one of my favorites. I think I like it as much because of its history as for anything else. She served the country for nearly fifty years. During World War II she escorted convoys in the Atlantic. During the Vietnam War she participated in interdiction and fire support missions off the coast of South Vietnam (1967 & 1968). She has a long list of citations including a “Presidential Unit Citation.”Two of the Duane’s sister ships are also in Florida… the Bibb and the Ingham. 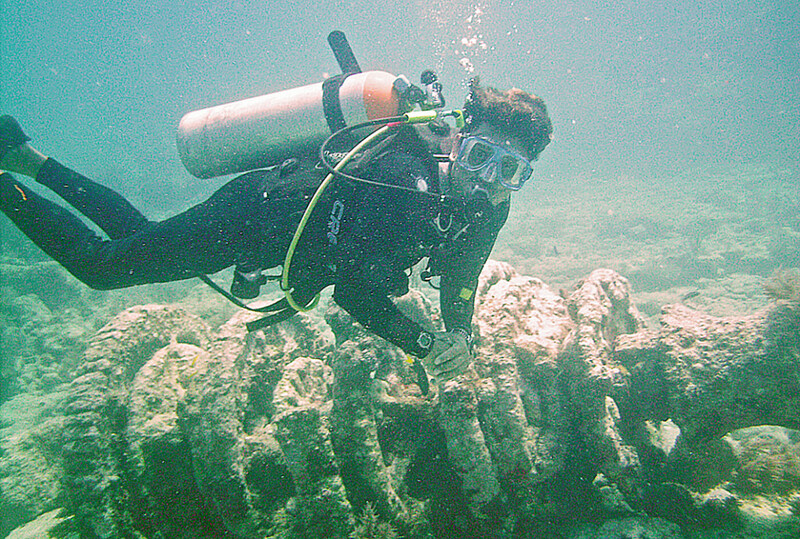 The Bibb was sunk near-by as an artificial reef and I have been SCUBA diving on her. The Ingham is a floating museum in Key West. Like the Duane, the Bibb and Ingham were convoy escorts during World War II and served off the coast of Vietnam. Diving on the Duane is for those with advanced certification because of its depth. There is usually a swift current so that often makes diving there quite challenging. This time was no different. The current was at about the max that we could dive in. The good news is that with that kind of current the “viz” is great. There were lots of large barracuda patrolling all around the ship. We discovered another giant grouper hiding inside the ship. Man… those are big fish. After the Duane we moved back to Molasses reef… “mo.” The current was still high so we did a “drift dive”. I love “drift dives”. The dive boat just drops the group of divers in the water and “drifts” along with them a short distance away. The divers descend (this time to about 45 ft) and then let the current carry them along. It’s really “neat”… you just sort of hover near the bottom and as the current carries you, you watch the underwater world go by. On this dive we saw stingrays, a giant eagle ray, a huge sea turtle and we captured two lion fish. This friendly sea turtle just swam by and didn’t seem to care anything about us. 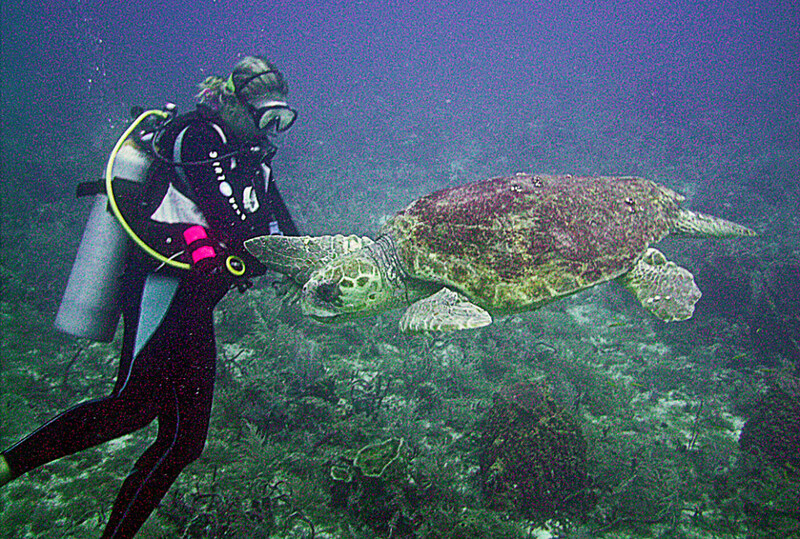 The dive sites around Key Largo are protected, “no take” places. That means that you can’t take anything you find with you nor can you take any fish. (No fishing is allowed in those areas either.) 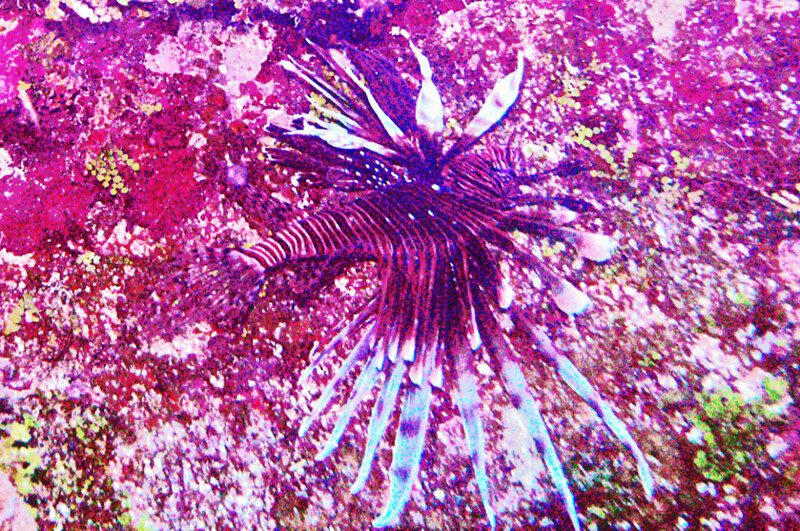 However, the Lion Fish is the exception. 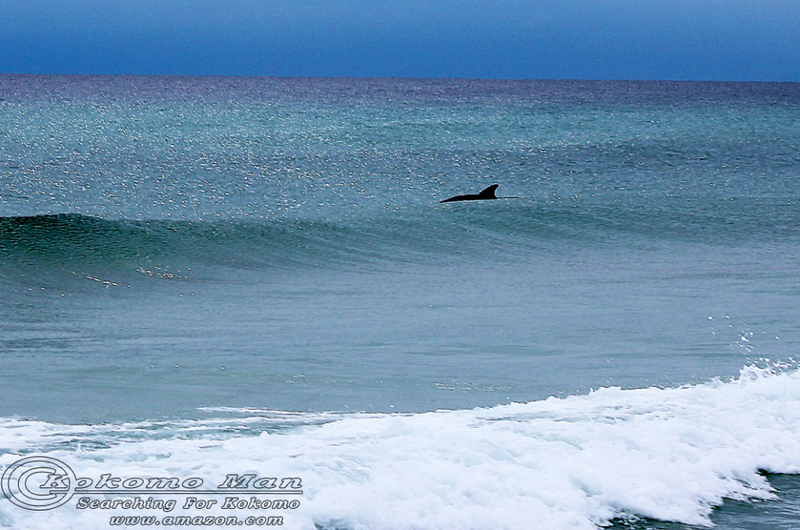 They are not natural to these waters and have no predators in the region. They are a danger to the other fish so it is allowed to capture them. All in all, the morning dives were very good. 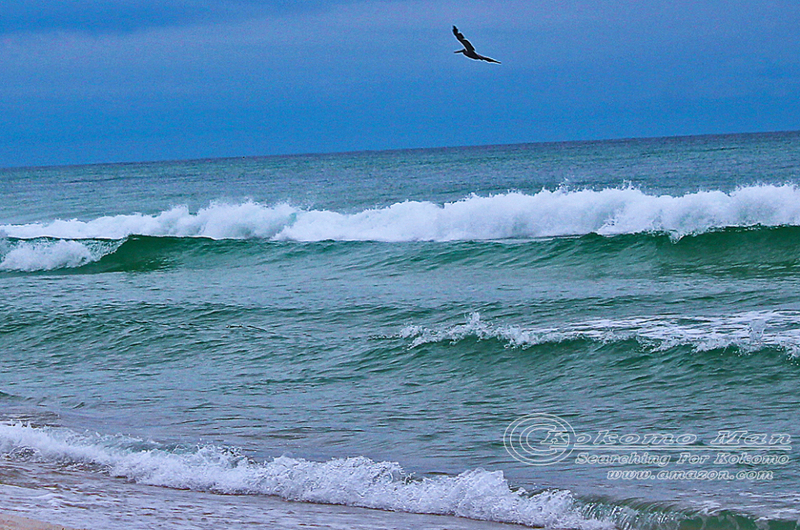 The water temperature was 82 degrees and was just what I was hoping for. That said, the night before I had a change of heart… I decided after the morning dives I would go to Key West; Cayo Hueso… BoneIsland. After all… this is summer’s last gasp and I couldn’t get this close and not go there. I suppose I should explain about the nicknames; “Cayo Hueso” and “BoneIsland”. Actually, that’s not a nickname. 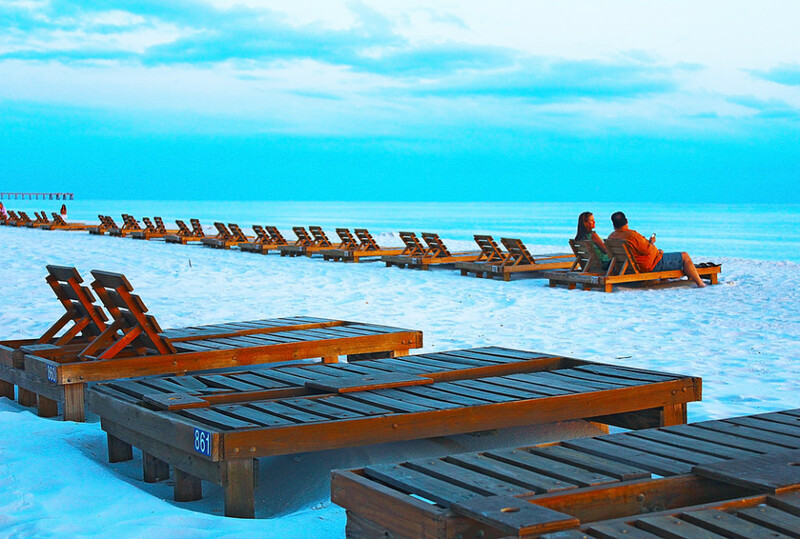 The Spanish originally named the island “Cayo Hueso” which translates to “BoneIsland”. 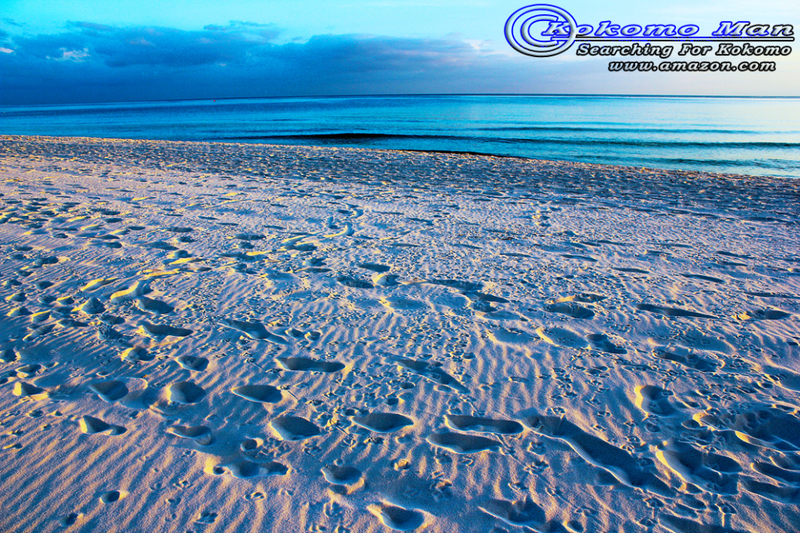 It was named that because of the bones the Spanish found all over the island… human bones. It had been an Indian burial ground. The world Hueso is pronounced “Weso”. 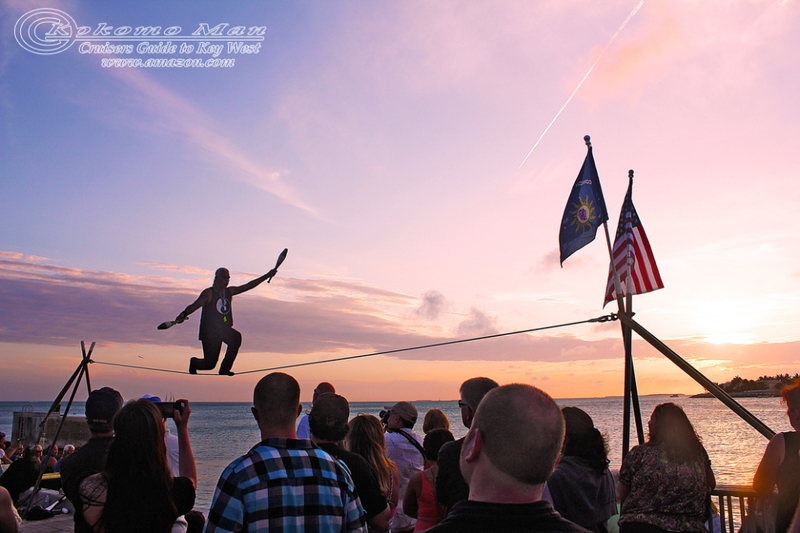 So when the Yankees heard the name they thought it was Cayo Westo… hence Key West. Anyway… instead of diving a couple more days, I decided to spend the time in Key Weird (another of the nicknames). I checked out of the motel before going on the the dives. 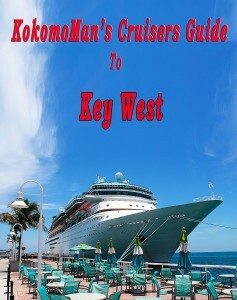 Then, after changing into some dry clothes, I put the top down and headed to Key West. I decided a trip to “The Keys” was in order. I had not been there for nearly a year. OH THE HORROR OF IT ALL!!! So I figured that would be a perfect first step in keeping summer going past Labor Day. 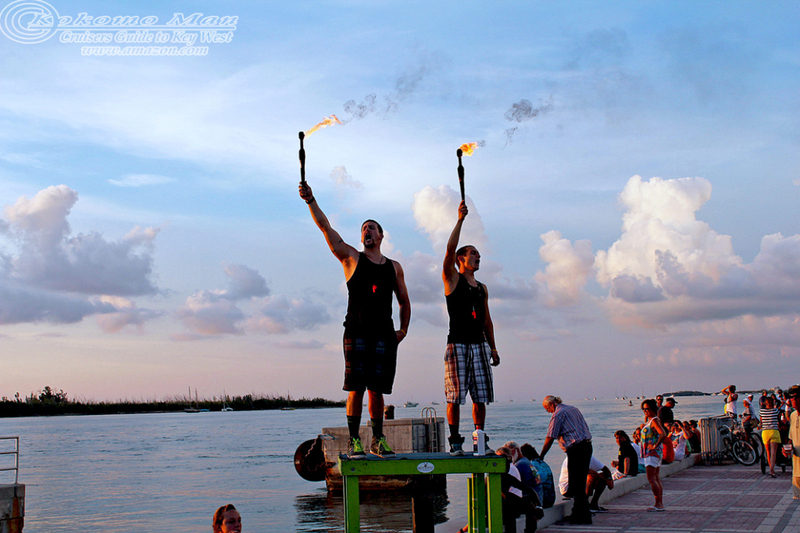 I always agonize on where to go in the Keys… Key Largo or Key West. Yeah, Yeah… I hear you; such a tough decision. I lived in Key West for a little while a last year and I’m still completely in love with the place. But… it had been only a few days since I had visited there while on the Carnival Breeze cruise ship. The thing is that cruise ships always miss the night stuff. 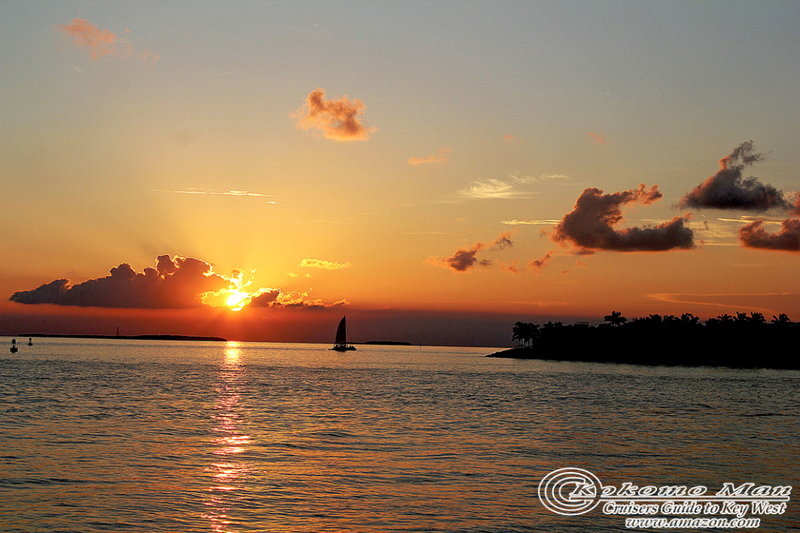 Ships are required to sail from Key West a minimum of two hours before sunset. The sunset at Mallory Square is one of the best in the world. 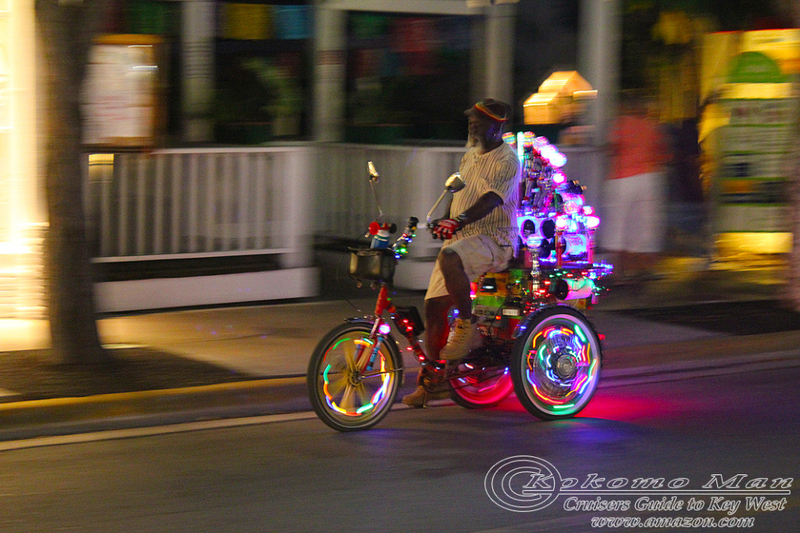 And… nights in Key West are always good for the soul. On the other hand, the SCUBA diving in the Key Largo area is the best in the Keys… some of the best in the whole world. And Key Largo is 100 miles closer to the Florida “mainland”. I always figure I can just zip down to Key Largo from Miami and be SCUBA diving in the afternoon with my favorite dive operator… Rainbow Reef. Also… even though Key Largo is a little more laid back than Key West, my favorite tiki bar in the world is in Key Largo. At Rainbow Reef dive kiosk… just in time to make the afternoon boat trip. If I had unlimited time and money I could spend as much time in the Keys as I wanted. But it is an expensive place to visit. Barely acceptable rooms cost nearly $200 per night in Key West. It’s a bit more reasonable in Key Largo… especially if I book through “Rainbow Reef”… but it’s still not cheap. Finally I decided. I would on a few days in Key Largo before heading back to the Northernmost Caribbean. I was already in Miami so just like I figured, a little after noon I was in line for a 1 PM dive boat trip out to Molasses reef. I was once asked if I could only dive in one place in the world, what I would choose. For me Molasses reef would be it. It’s a huge barrier reef just a few miles off shore from Key Largo. But I suppose choosing “Molasses Reef” is kinda cheating on my part. That’s because “Mo”, as the locals call it, is actually a collection of dive sites. With places with names like “Wench Hole”, “Spanish Anchor”, “FireCoralCave” and “Hole in the Wall” there’s always plenty to see and explore. There are “un-officially” 10 dive spots at “Mo” along with over 25 mooring buoys. 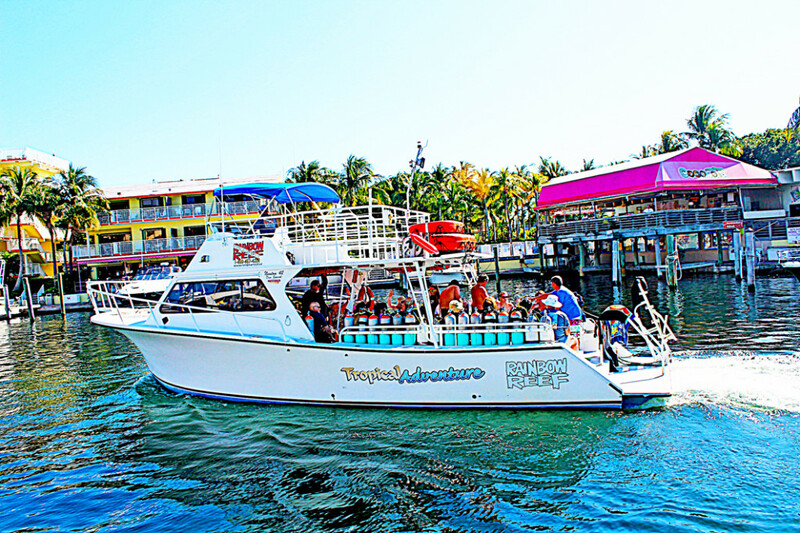 The visibility… or “vis”… is almost always great anywhere around Key Largo. “Vis” is the “holy grail” for divers. For most places in the world, 30-40 ft “vis” would be a great day. In Key Largo that would be a bad day. 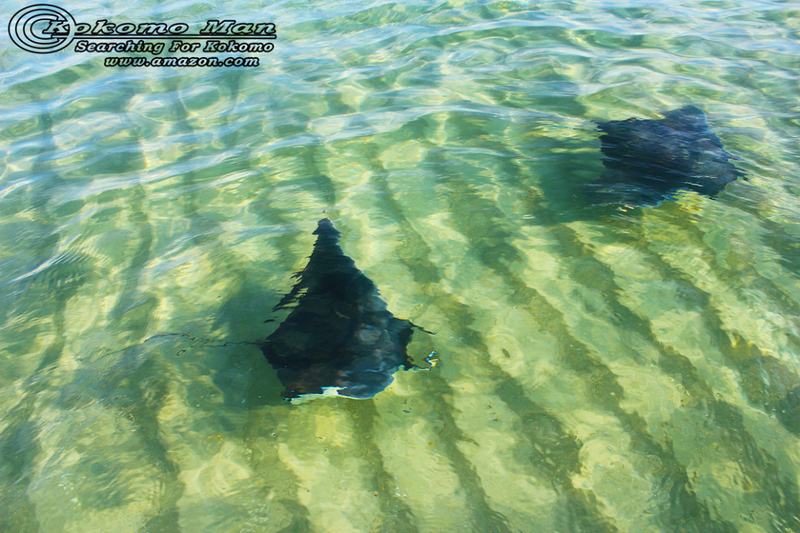 This time was great as I expected… we had 60 – 70 ft. “vis.” Just an average day for Key Largo. And the water was in the mid-eighties. I fully admit that when it comes to cold water, I’m a wimp. I consider it to be winter-time diving any time the water is below 80 deg. F. And I won’t dive if the temperature is much below 75… even then I wear a thicker wet-suit. Did I say… “wimp”. 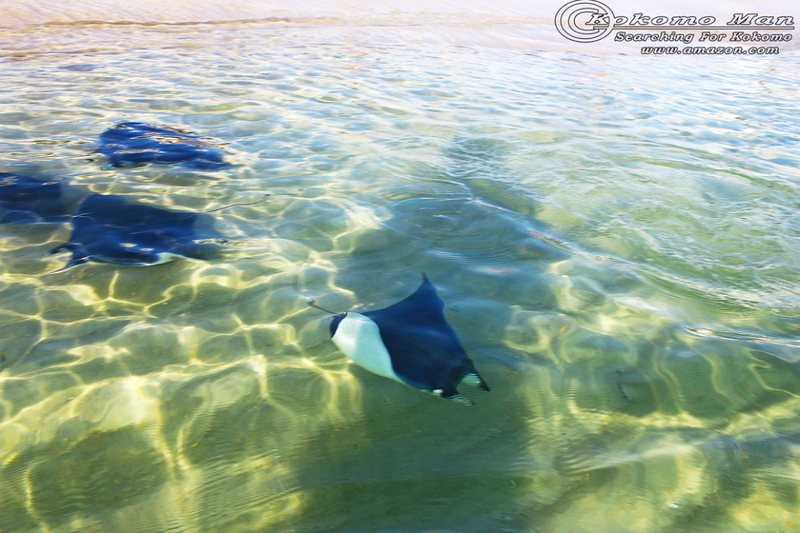 Warm waters are the reasons I dive in the Keys and the Caribbean. The pacific coast of the US is simply too cold for me all year round. The Tropical Adventure on the way to “Mo”. I arrived at the Rainbow Reef kiosk just in time to go out on the boat dive for two single tank dives in the afternoon. For the first dive we went to FireCoralCave. It’s just what it sounds like… a cave with fire coral. Besides being a cave, this is also a swim through. You enter at one end and come out the other. But for this dive we couldn’t swim through… it was occupied by a giant Grouper. This was a truly massive fish that must have weighed four or five hundred pounds. No… I’m not making a silly exaggeration. It was really that big. Although the giant groupers don’t seem aggressive toward divers, we didn’t want to make him mad. Giant groupers are known to eat sharks. So we just let him have the cave. 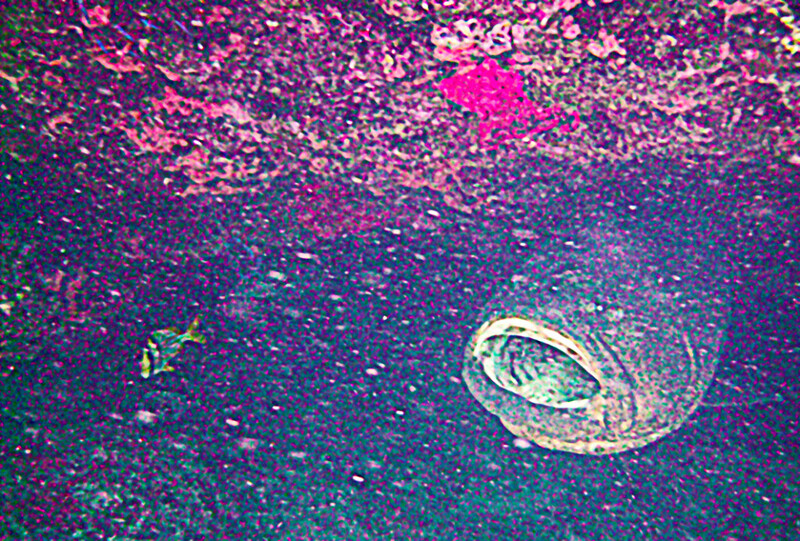 Although it’s not a very good image, this is the giant grouper that occupied Fire Coral Cave. Look carefully to the left of the groupers mouth and you will see a sergeant major fish. For the second dive we moved over to Wench Hole. This has nothing to do with pirates or women or anything like that. Rather, a three masted wooden schooner, the Slobodana, sunk here in 1887. Today, what remains is a massive wench, some ballast, and a few gears. All around Wench Hole are huge coral heads which are home to zillions of marine life. I have been to Wench Hole a number of times and no matter what, I always see amazing stuff. The wench at “Wench Hole”. After the dive I grabbed a quick bite to eat and then went to my favorite tiki bar. It’s actually the bar at the Holiday Inn swimming pool. The Holiday Inn in Key Largo has kind of a “Bogie and Bachal”… theme. The restaurant is called “Bogies Café” and posters of Humphrey Bogart and Lauren Bachal adorn the walls. And of course the tiki bar is “Bogie’s tiki bar”. I sat down at the tiki bar and ordered my usual when in Key Largo… a Mexican Mojito. I’m probably the only person in the world that orders that… tequila instead of rum… so the bar-tender immediately did a double take and then recognized me. He said it was good to see me and that it had been a long time. I said, “yeah… way too long”. I don’t plan on it being that long ever again. I sat at the bar for a while chatting with some of the other people that had been diving with me. Most of us were going to go diving the next day and wanted to go to the Duane… an ex Coast Guard cutter sunk as an artificial reef. After a couple of Mexican Mojitos it was starting to get dark. I figured that I should go check in. It had been a really good day… warm weather, warm water, great diving, and new friends. Even though it was September, it was a good day and a great way to keep summer going. 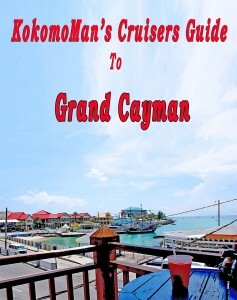 For anyone thinking about a cruise with stops in Key West or Grand Cayman, there are two Kindle books you should check out; KokomoMan’s Guide to Key West and KokomoMan’s Guide to Grand Cayman. These are very inexpensive at $3.83 each. They have just about everything you need to know for planning your day at each of these very popular cruise ship stops. You can read the first part of the book on the amazon web site to see if it’s for you. Click on either image below to go to Amazon, Then when you get to the amazon page, click on the cover image to “look inside”. I’m sitting here in the frozen tundra contemplating the onset of winter. Every year about this time I start to get a little melancholy. You see… I’m a summer person. I always have been. Ever since I was a little boy growing up in Southern California, the warm and yes… hot summer days were carefree times. No more teachers; no more books and all that stuff. As I got a little older, summer was a time for swimming, the beach and… girls *smiley face*. Again, the warm days; the barefoot days; and the time spent getting that almost all over tan were the great times of my youth. I wasn’t sure if melancholy was the right word to use here. So, I used Sir Google to look it up. I found that it means; sadness, dejection, despondent, gloomy, glum, downcast, sorrowful or blue. In olden days, it was thought to be caused by “Black Bile”. Yep… that about summed it up for me this year. I had the Black Bile. But I wasn’t going to let summer get away that easily. Not no how… not no way… not me. After all it was still warm and most folks would consider it flat-out hot. The ocean water temperature was still eighty-something degrees. I could go swim, snorkel, or even SCUBA dive without the slightest hint of it being cold. So I decided that I would not let summer end. I was bound and determined to make it last at least till my annual trek to Sin City in late October. So, I invite you to join me for a series of installments of “Summer’s Last Gasp”.